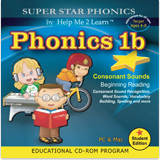 Phonics 1b picks up where Phonics 1b left off, thoroughly covering one-sound consonants, sight words, and sounds in the middle of words. Want To Tell A Friend About Phonics 1b!! !